Here is my Tampa fishing forecast for the July issue of Saltwater Angler Magazine. Summertime is here and so is the heat. The key for success the next couple of months is to get an early start to avoid the heat and the afternoon thunderstorms. The Silver King (aka tarpon) has topped our list the last couple of months, but don’t say goodbye yet. You will still have a chance at a late season Tampa Tarpon. To keep the rod bent and drag screaming, spanish mackerel will be the ticket. Mangrove snapper will keep you busy this month as they prepare to spawn. Don’t overlook shark, grouper, or cobia. Look to fish deeper waters as our water temperatures heat up and the fish search for cooler water. The Tampa tarpon fishing bite in the previous two months has been one of the better bites I have experienced. The July bite tends to wind down, but there will still be some fish around. The Skyway Bridge will provide a good possibility for a hook up. Heavy gear is essential for success to land a tarpon around the bridge’s structure. If you want to venture out of the region, the beaches off Anna Maria, Egmont and Ft. De Soto will still hold pods of tarpon. The key is to get out early and be stealthy. Look for pods of fish cruising the beach and setup ahead of the school and present bait. Crabs and threadfins are the bait of choice. Scaled sardine or pinfish will also produce. Fishing Tampa bay for redfish is still going strong. Look for them to take refuge from the sun’s heat under mangroves. Areas like Simmons Park, Cockroach Bay and Joe Island are prime spots to score a catch. Cut bait seems to be the more popular bait, but don’t overlook artificial. Dead stick a scented bait under a mangrove and it is sure to produce a bite. I have tried to stay away from fishing snook in Tampa this year. We need to give them as much of a break as possible. The only time I have fished them is for a few charity tournaments. Our region around the Alafia River is holding a good number of healthy fish. I fished a charity slam tournament last month and had a very promising experience. We had several big snook caught that looked very healthy. 33” took biggest snook for the tournament. We also had 32”, 29” and several that were 27” and below. If you do catch snook this month, remember season will remain closed. Be sure to handle each fish with extreme care and get them back in the water ASAP. If you are looking to keep the rods bent, drag screaming and for decent table fair, the spanish mackerel will be your target. Find any shipping channel, range marker or any other structure in our region and you are sure to run into the mackerel. Anchor up tide, create a chum slick and hang on. I prefer small scaled sardine on a long shank hook with 40lb of fluorocarbon leader. You will have more cut off’s compared to steel leader, but I believe you will have more hookups. Areas to try: Skyway Bridge and ship channel, Port Manatee artificial reef, and the Bahia Beach reef. The cobia run has started off with a bang this year. We have had multiple hookup days. This has been the best cobia run in recent years. Have rod rigged with a pinfish, check the makers on your way to your fishing holes, and you are sure to encounter the brown bomber. 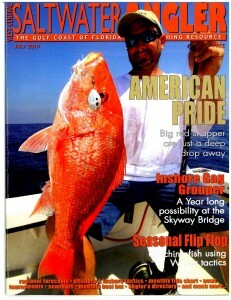 Snapper fishing should start to kick off this month. Mangrove snapper will start to school up and prepare to spawn. The ship channels and other ledges will hold schools of snapper. A small newly hatched scaled sardine will be the best bait. Scale down your tackle as much as possible to ensure lots of action. While fishing the same areas, have a heavy rod rigged and ready to battle the man in the grey suit that may be lurking under your boat for an easy prey. Black tip, hammerheads, spinners and others will be willing to play.